On our way back from Mountain Meadow Monument Jill and I stopped by Old Iron Town State Park. There is a sign located along highway 56 about 20 miles west of Cedar City. At the sign we turned south and traveled on a gravel road for approximately five miles to the ruins. The park is free and open year round during daylight hours. It appears that Old Iron Town is also referred to as Iron City and Little Pinto. I will just call it Iron Town. 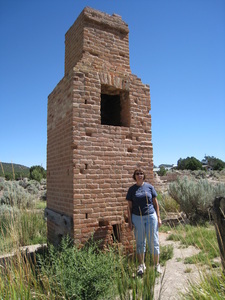 Lack of iron was a major concern to pioneers who began settling in Utah in 1847. When iron deposits were discovered in southern Utah, Mormon leader Brigham Young called for volunteers to colonize the Iron Mission area. 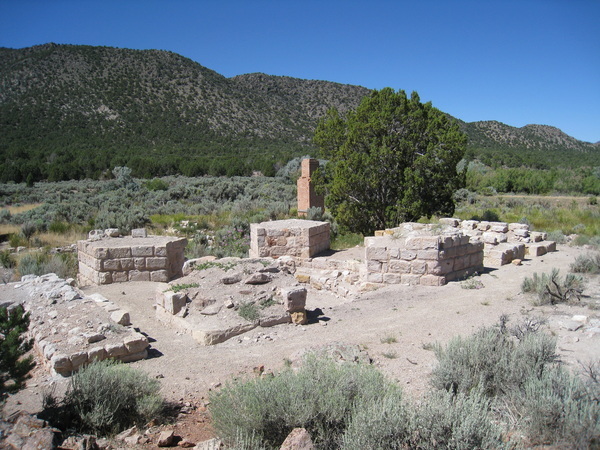 A site near Coal Creek, now Cedar City, was selected in November 1851 for the iron works but the foundry was eventually closed in 1858. Iron Town, founded by Ebenezer Hanks, was Iron County’s second attempt at mining iron. 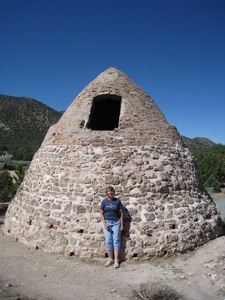 The town had an iron furnace with a 2,500 pound capacity and was operated from June 1868 to 1877. There was a brick schoolhouse, machine shop, blacksmith shop, pattern shop, molding shop, erastra (grinding device), and two charcoal kilns. By 1871 a post office, boarding house, butcher shop, and general store were added. While Iron Town seemed prosperous at the time, it only operated for nine years, closing because of the lack of sufficient transportation to Northern Utah for the iron ore and the money panic of 1874. By 1870 the town had nearly 97 residents living in 19 residences. Many of the workers were not members of the conservative religion and Iron Town soon became a place where drinking and swearing were commonplace. Producing iron in the 19th century began with the combination of raw ore with a mixture of fuel and limestone. This was called a “charge” which “hardened” the furnace. 800 pounds of iron of good quality was produced each 8 hours, the plant running day and night. 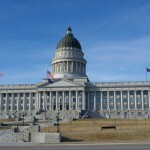 The enterprise was taken over in 1883 by The Iron Manufacturing Company of Utah with George Q. Cannon as president. A railroad was moved here from Nevada to haul coal from Cedar Canyon. Iron was provided for the 12 oxen that support the St. George LDS temple baptismal font. Charcoal proved the fuel of choice at Iron Town. It was created by burning or smoldering wood in a reduced oxygen environment. Using charcoal benefited the workers at Iron Town because wood was readily available and it produced a softer more pliable piece of iron. 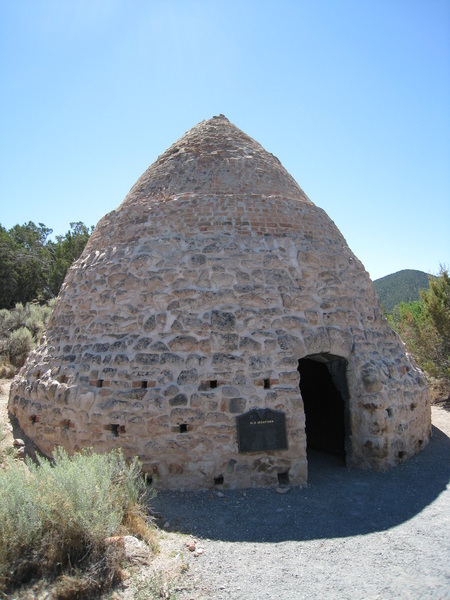 Workers would stack piles of juniper and pinyon inside the beehive shaped kilns and light a fire underneath. The holes seen around the wall could be plugged or opened as needed to increase or decrease air circulation. It took approximately 12 days for one kiln to produce 50 bushels of charcoal. This would provide enough fuel to process one ton of iron ore. Iron Town originally had two kilns but because of weather and looters only one remains. There is also a nature trail in the park. Various trees and plants have a sign by them to tell you what they are. So now we know what juniper, pinyon pine, basin wildrye, squawbrush, prickly pear cactus, big sagebrush, and rubber rabbitbrush look like. Another name for Iron Town was Little Pinto. Perhaps the name came from nearby Pinto Creek which was the vital water source for the town. The stream was used to turn the waterwheel that pumped the bellows. 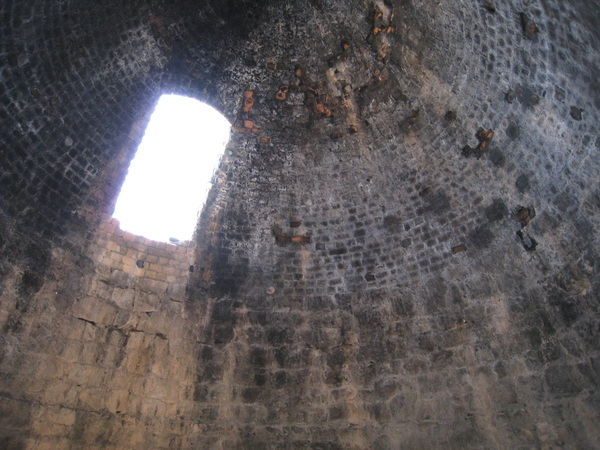 The air thus provided would heat the furnace to the extreme temperatures needed to produce iron. The stream also met the daily water needs of the people, their livestock, and their crops. that are some fine pictures! what camera are you using? I am using a Canon Powershot SD870 IS. 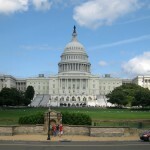 I have resized the photographs for the web. The full resolution is 3264 x 2448. I like it because I can carry it around in my pocket. I use a 8 G byte SD chip and carry a spare battery. I am glad you like the photographs. 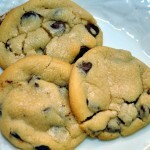 Enjoy your day. The whole charcoal-production part was fascinating. 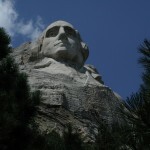 Did you know all that already, have a guided tour, were there plaques there at the park, or did you read about . No tour. I read the plaques and a did a little research. Thanks for visiting.